Exactly 500 years ago – on October 31st, 1517, a monk named Martin Luther changed the world. Concerned about the serious errors he that he believed were being taught by the Roman Catholic Church, he wrote down a list of 95 problems that he believed needed change, and (depending on the historian you talked to) either nailed them to the door of the All Saints Church in Wittenberg, or else mailed them from Wittenberg to the archbishop of Mainz. Whichever way it happened, that event is how all the turmoil started. I am studying at Brandenburg University of Technology, and my blog has been silent for a few months while I adjust to my studies. But I wanted to write something for this special time, the 500th year since Luther started the Protestant Reformation. But what is the Protestant Reformation? What happened 500 years ago that was so special? What is so important about this list that Martin Luther made? Today, as I travel out to Lutherstadt Wittenberg, the birthplace of this theological revolution, this post will upload and you can learn the basics of just what makes that day so remarkable. Last week, I introduced the history of Thanksgiving in the United States. Since the first Thanksgiving has, retrospectively, been applied to the 1621 harvest festival celebrated by the Pilgrims, I’ve been exploring that history. Last week, I gave an overview of what is modern-day New England in the 1600s from the perspective of the Native Americans, particularly the Wampanoag. Today, I will look at the history of the Pilgrim Fathers, their intersection with the Wampanoag, and what is credited as the first Thanksgiving. Tomorrow, people all throughout the United States, Ireland, and Scotland will celebrate Halloween. Children will dress up in costumes and go door-to-door asking for candy, adults will dress up and go to parties, and, if you are in Ireland, where Halloween is a national holiday, fireworks will be launched. But where does this holiday and its traditions come from? Last week, I finished with the organization of the Shakers following the death of their founder, Ann Lee. I also gave an overview of the communities that they establish in the Northeast United States. This week we will look at the Western expansion of the Shakers and their overall history after that, up to the present day. In last week’s post, I introduced the Shakers and recounted their early history, up to the death of their founder, Ann Lee, in Niskayuna outside of Albany. This week, I’ll explain the history of the Shakers after Ann Lee’s death. The chaotic exuberance of individual expression that defined the time of Ann Lee will soon evolve into a more orderly and communal, but no less enthusiastic, way of life. The death of Ann Lee shocked her following. Some were convinced that she would live forever, despite her own, vehement claims to the contrary. While many of the seemingly devoted soon left after this tragedy, the Shakers did continue. James Whittaker, as a close and widely respected companion of Ann Lee, took over the lead of the faith in her stead. However, in 1787, he also passed away, likely due to the hardships and persecutions he’d faced during his life. In his place, Joseph Meacham, the minister from New Lebanon, whom Ann Lee called the “first-born of America” and indicated as her rightful successor, was selected to lead the Shakers. There is some question, historically, over whether there was a power struggle in the years from 1784 to 1787, particularly a debate over whether Joseph Meacham or his brother, David, should lead. The primary source material from this period is largely silent on this, possibly because Joseph Meacham won out in the long run. Joseph, wanting to ensure equality among the Shakers, appointed a woman named Lucy Wright, a native of Pittsfield, Massachusetts, to be his partner in ministry. Devoted yet ambitious, Joseph and Lucy reorganized the Shakers, setting up a model of society and worship that would last them up the present day. To keep the Shaker movement from dissolving, it would need structure, and these two leaders would provide it. Though Niskayuna, by this time known as Watervliet, was the first Shaker settlement, Joseph and Lucy set up New Lebanon as the headquarters for the Shaker faith. No longer would Shakers live apart on their respective farms and in their own houses. The Ministry at New Lebanon now dictated that Shakers should live together in a unified community, sharing all their lands and goods among themselves freely. 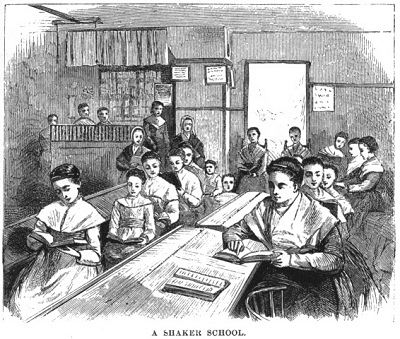 Each Shaker community would then be further divided up into different Orders, or Families. The Church Family or First Family would be the most devoted and respected Shakers. A Second Family would consist of novitiates, persons who were interested in becoming Shakers and were trying out a Shaker life. Other Families would be established for additional Believers. These usually were named after their geographical position relative to the Church Family: North, South, East, and West (if there were more than four, some might take the name of a particular industry, such as Union Village’s Mill Family). But the New Lebanon Ministry did more that just set up a model of community organization. It also streamlined Shaker religious practice. While Joseph and Lucy fully encouraged ecstatic, charismatic worship, they stressed that worship was now communal: Instead of individuals each singing, dancing, and shaking on their own, they all would sing and dance together. Laws regarding proper conduct for daily life were also formulated, and routines established. By 1790, the Hancock Shakers organized, with a village centered at Hancock but stretching across town lines into Pittsfield and Richmond. By 1794, eight more communities had organized in Tyringham, Harvard, and Shirley, Massachusetts; Enfield, Connecticut; Canterbury and Enfield, New Hampshire; and Alfred and Sabbathday Lake, Maine. Joseph Meacham died two years later, but Mother Lucy, as she became known, would carry the Shakers into the 19th century and presided over their Golden Age. Next week, we will learn about this Golden Age, and the subsequent history of the Shakers up to the present day. The time: March 1522 A.D. The place: Zurich, Switzerland. It is the time of the Lenten fast. All Catholic peoples are forbidden from eating meat (other than fish) during this somber time of fasting and abstinence. However, a few radical minded men plan to change that. They plan to eat some smoked sausages.